You are here: Home/ News/ Four in-a-row for Kerry! 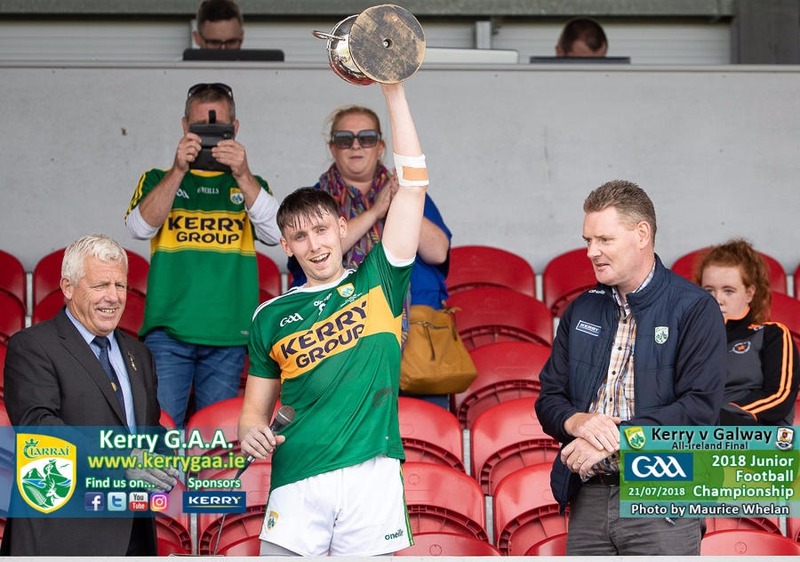 KERRY’S DOMINANCE OF the All-Ireland junior football grade continued, but only just as they were let off the hook by some poor Galway shooting as the Tribesmen were left to rue 15 wides in today’s final in Ennis. A tightly fought first-half saw Kerry just go in ahead thanks to Evan Cronin’s second point in proceedings after Galway had managed to pull level following a four-point deficit at various stages of the first period. Paudie Clifford went on an incredible run from the 45-metre line for Kerry’s goal in the seventh minute that gave them a lead of 1-2 to 0-1 with their goalkeeper Darragh O’Shea denying Galway’s Padraic Cunningham at the other end three minutes later. O’Shea could not deny Cunningham in the 21st minute however when another chance came the full-forward’s way as Kerry’s lead was now only 1-5 to 1-4. Cunningham appeared to have sent the sides in level at 1-6 a-piece before Cronin ensured it would be a lead of 1-7 to 1-6 at the break for Kerry. They scored the first three points of the second period to go back in front by four after 35 minutes but had to wait 13 minutes for their next score as Galway scored 1-2 without reply to go in front, Jonathan Ryan their second goalscorer in the 46th minute before a free from Thomas Hickey made it level at 2-8 to 1-11. Clifford was central to Kerry’s second goal, fouled for the penalty that Niall Ó Sé converted to put them in front by two. Galway pushed hard to make amends but Hickey’s fourth point was enough to ensure a fourth title in-a-row for Kerry and a 19th in total. Scorers for Kerry: Niall Ó Sé (1-4, 1p, 2f), Thomas Hickey (0-4, 2f), Paudie Clifford (1-0), Lee O’Donoghue & Evan Cronin (0-2 each) and Denis Daly (0-1). Scorers for Galway: Jonathon Ryan (1-2, 1f), Padraic Cunningham (1-1), Shane Gaffney (0-4, 4f), Alan Molloy, Michael Day, Antaine Ó Laoí and Martin Coady (0-1 each).